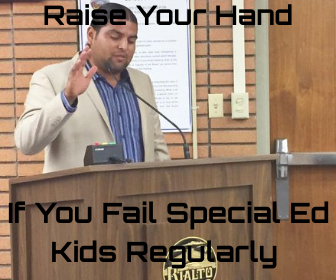 If you are aware of Rialto Unified School District past with problems with their Special Education program then this story will bother you but not surprise you. Anyone else will both be shocked and surprised at what Seven Year Old Caiden Trujillo had to go through on Monday April 23rd. Caiden Trujillo a 1st grader at Kordyak Elementary was removed from his classroom and was forced to face adults he didn’t know which included officers from 3 different public safety agencies. Caiden Trujillo is an Autistic child who is in school under an IEP (Individual Education Plan) he is in Special Education in the RSP program (Resource Specialist Program). This program helps kids who qualify as a student learner that requires some assistance but can still find educational success in a regular education environment. “The events that led up to Mondays incident are a direct result of Rialto Unified School Districts lack of ability to do what is right for Caiden Trujillo” his mother and her advocate said. All children work better under the confines of a schedule this is why kids have regular bedtimes and preform better in school when there is a regular flow to the day. Well Autistic children require as much structure as possible and don’t do well with changes. They trust who they know and any sudden changes to their Aide, Teacher or class day leads to them having a bad day. Caiden has had two teachers this year and his one on one aide was leaving this job for another so Caiden was loosing the person that helped him work through a regular school day. On this Monday there was a plan in place that when Caiden’s aide left at 11am to do paperwork for her new job. Jon a person that Caiden know was going to take over Caiden’s case for this school year and help train the new staff member, the new staff member would be shadowing Jon so that Caiden would be more comfortable with this change. Well another situation took Jon’s attention to another school site leaving the new employee to work with Caiden without any prior introduction or phasing in period. Caiden had a teacher switch during Christmas break. Mrs Rubalcava Caiden’s new teacher has refused to communicate with Caiden’s mom in person. Mrs Rubalcava said “she only teaches GATE kids not Special Ed kids”. At this years IEP meeting Mrs Rubalcava had to be instricted on how to grade Caiden’s work according to his IEP by District office personel. Caiden’s mother Sandra Trujillo has felt disrespected and treated poorly by both the Principal and Teacher at this school. Caiden did not respond well to a new person as his aide and began to act out and cause a disturbance in the classroom. None of the in class interventions were working so Caiden was taken to a designated safe room where he could collect himself and not be a distraction to the rest of the class. The safe room was not working that day and Caiden continued to act out by pushing over a desk and some chairs. Instead of following the IEP and calling mom right away Mrs Kemp the school principal decided to call Rialto Unified School Safety officers and Police officer from Rialto and Fontana Unified School District Police Department. Caiden’s mother did not know what was going on until a staff member called her to tell her to “come to the school quick they are arresting Caiden” and then hung up. During this time Caiden’s older brother a 4th grade student at Kordyak heard somone say that they were going to put his brother into handcuffs as he was passing by the school office. Sandra Trujillo-Langdon came to the school to be greeted by a Fontana School Police officer that informed her that he would need to speak to her. Mrs Trujillo-Langdon refused the conversation and went to her son who was crying and visibly afraid. Her son said mom they are going to put me in cuffs and take me to jail! Mrs Trujillo-Langdon asked who called the police and Dr. Kemp the school Principal eventually admitted to calling the authorities. Mrs Trujillo-Langdon then asked why were they going to put him in handcuffs and take him to jail and they said it was done to make him calm down it was a threat not something they were going to do for real. At this time the mother asked to have the room cleared so she could calm her son down. While in the room Mrs Trujillo-Langdon saw that Caiden was only going to be better once she got him off campus. So she took her kids off campus through a side door and left. While leaving Mrs Trujillo-Langdon said that school staff and law enforcement officers were acting likr they were hunting down the small family. Caiden was so effected by this situation that he didn’t want to return home because the school and police knew where he lived. Mrs Trujillo-Langdon had to take Caiden all the way to Buena Park to Knotts Berry Farm to allow him to have peace knowing he was away from the long hands of the police that threatened him. Yet Caiden still suffered as he saw a police officer at Knotts and began to cry please don’t take me to jail I am a good boy and waking up Tuesday morning saying he had a nightmare that he was taken to baby jail. Rialto Police Lt Paul Stella said that Rialto PD Although one of our officers did respond to the call yesterday at Kordyak Elementary, our officer never made contact with mom and student. I encourage you to reach out to the Fontana Unified School Police Department who was also on scene and may have further information regarding this call. When pressed Lt Stella would not say from where the call for service originated from “We will not be releasing the Reporting Person’s information and any request via the call for this information under the Public Records Act would have that information redacted.” Rialto Police Lt. Stella is refusing to release the name of the officer or any other details in regards to this incident. Syeda Jafri RUSD School Spokesperson also said that a full investigation of this incident will be contucted because the School Distirct wants to get to the bottom of what happened here so that it never happens again. We have spoke to Sgt Avalos at Fontana School Police he said that they were called out to Kordyak elementary school where a student was being violent and trying to harm a teacher with scissors. When the officer arrived there was a discussion of restraining the child with handcuffs but that was deemed unnecessary. The mother and child left before the Fontana School Officer could interview them. The parent is made it clear a person in uniform told her son her was going to be put in handcuffs. The School board members are reaching out to begin to get the verbiage around this situation under control (direct blame away from them). 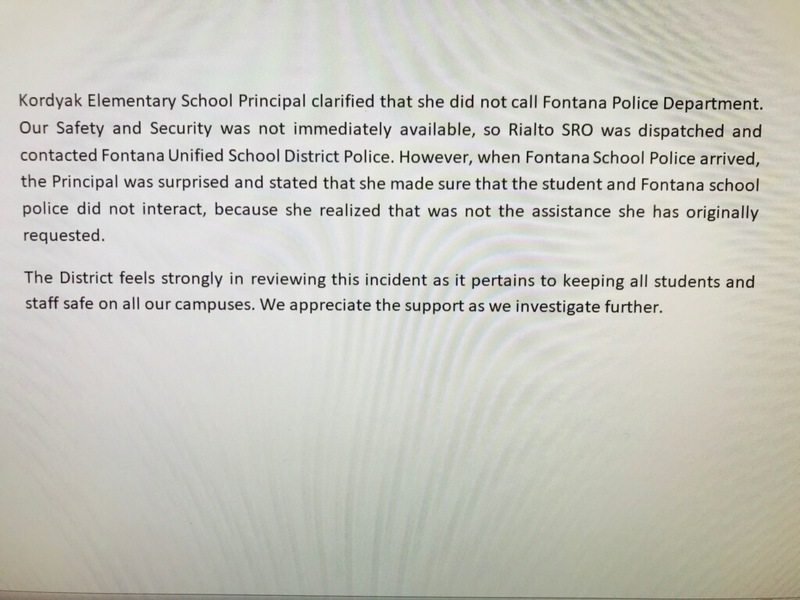 The school districts statement never says weather the Rialto Police officer never made contact with the student. Rialto Police Information Officer Stella refuses to give out where the call for service originated from weather it was the school principal, RUSD Public Safety or someone else (even refuses to give the officers name). So what we have here is a problem because this student refuses to return to school, his mother doesn’t feel safe having him at school and now his brother no longer feels safe at school. The parent is clear that a person in uniform spoke to her and her son says that the officer spoke to him too. The Mother described the officer as a Hispanic man about my height (I am 5’10”). Only time will tell what really went on here. Hopefully the Districts investigation will pull that out soon.